To reframe and rename disability in order to focus on uniqueness and resilience rather than abnormality and deficit. To put into practice Gandhi's idea that, in order to change the world, we must first changeourselves to reflect the change we wish to see in the world. To find new ways for people who experience disability (and those who don't, yet) to interact with each other. It's one of the biggest gripes of people with access needs - drivers who park in accessible (or mobility) parking spaces when they don't need to. It's tempting to get mad, challenge them or report them, but now you can just give them a different way to think, which may stop them doing it again.We've designed a funny but thought-provoking notice that you can leave on the car windscreen or even politely hand to someone. 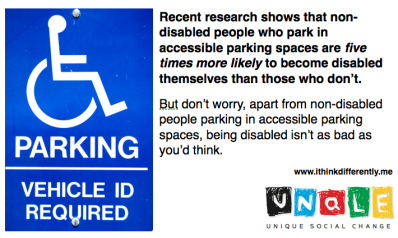 It reads:Recent research shows that non-disabled people who park in accessible parking spaces are five times more likely to become disabled themselves than those who don't.But don't worry, apart from non-disabled people parking in accessible parking spaces, being disabled isn't as bad as you'd think.They are available in two sizes - A5 (210 x 148 mm | 8.3 x 5.8 in) and A6 (148 x 105 mm | 5.8 x 4.1 in).Simply download the size you want, print, cut and keep a stash in your bag or car.Spread the word and let us know if you use them by leaving a comment below! Getting into the Chevrolet Equinox is so easy, its owners may never notice. The small crossover's narrow rocker panels require minimal reach to step over, and its seat height requires minimal bending. Equinox's ease of entry is just one example of Chevrolet's use of universal design, an approach that makes products of all kinds work for as many people as possible. Consumers experience universal design every day, from sidewalk ramps to lever-style door handles. For most people, universal design adds convenience, but for people with limited range of motion, it can be a difference maker. A rear vision camera, programmable liftgate and easy-to-use touch screen controls are examples of Equinox's ease-of-use features. Ease of use is increasingly important to car design as automakers adapt to changing consumer demographics. According to the U.S. Census Bureau, the 65-and-older population is projected to grow to more than 71 million by 2030, and will account for 20 percent of the nation's citizenry. That means more car buyers will be dealing with age-related issues that affect range of motion, eyesight, hearing, reflexes and cognition - issues that General Motors has studied in depth and has already begun to address in many of its vehicles such as the Equinox. "We never design vehicles specifically for older consumers, but we increasingly integrate design solutions that work for all users, regardless of age," said Carl Wellborn, senior staff engineer and project manager, GM Design and Technology Fusion. "Designs that make life easier for older users also work for younger users. Universal design is the key to unlocking usability solutions and implementing them successfully." Wellborn presented GM's findings on increasing product value for an aging global market at the American Occupational Therapy Association's national convention last year. The research was based on dozens of interviews with consumers who ranged in age from 21 to 65 and older. "We are thrilled that GM is interested in better understanding the unique needs of aging drivers," said Elin Schold Davis, project coordinator of the Older Driver Initiative at the American Occupational Therapy Association in Bethesda, Md. "We are a car-dependent nation and want to maintain our driving independence as long as we can. Vehicles that use universal designs can make it easier and safer for people to have and enjoy personal transportation well into old age." For automakers, the rising number of older car buyers is impossible to ignore, because Baby Boomers, the generation now reaching retirement age, buy the most new vehicles. According to a recent study from J.D. Power and AARP, people ages 50 and older now buy more than six of every 10 new vehicles sold - up 39 percent since 2001. In the information released by Chevy, the examples of universal design and ease of use design include a simple to step over sill (once called a rocker panel) under the door. If that sill requires a step over some drivers with limited mobility would have a hard time entering and exiting. Careful, thoughtful design can eliminate the issue. To the contrary, some vehicles are purpose built. For example the Lotus Elise is a track car thinly disguised as a road car. When one first opens the Elise door the sill to step over is the size of a carry-on bag. Entering requires dexterity, flexibility, bravado, and faith. However, that thick sill is actually a part of the vehicle's box frame and it gives the car such rigidity it impacts the car's cornering in amazing ways. The Chevy Equinox is a general purpose vehicle so ease of entry matters a lot. It can be argued that some design elements would best be similar on a Chevy Equinox, Chevy Corvette, and a Chevy Silverado, any vehicle for that matter. For example, at a recent press preview my co-driver and I were testing a new car that was outstanding in pretty much every way. We won't tell you the name of the vehicle but it rhymes with "Lexus ES300h." Despite my co-driver's many years of testing cars and infotainment systems, and the fact that the other person in the car owned two modern Lexus vehicles, nobody could figure out how to turn up the volume of the navigation system. It was too low to hear (perhaps adjusted by a cheeky journalist who had just given up the vehicle ahead of us?) This highlighted for the group that navigation systems are becoming almost universal now. Shouldn't a driver be able to plop into the seat and quickly make it work without watching a DVD, or reading a operations manual as thick as War and Peace? The brake and accelleration pedals are always right where expect them, shouldn't the volume controls for the navigation system also be predictable? Commenting on universal design Carl Wellborn, senior staff engineer and project manager, GM Design and Technology Fusion said "Universal design is the key to unlocking usability solutions and implementing them successfully." One simple example of universal design that helps folks of all mobility levels is the Equinox rear view camera. No longer really a luxury feature, the rear view camera only costs automakers a few dollars to integrate to an existing infotainment system. Yet, its value can be much greater than that if it helps people see behind the SUV, particularly people for whom twisting is difficult. DREDF is unveiling a short web survey, Public Transit Choices By People With Disabilities, as part of our transportation research on the Americans with Disabilities Act (ADA). We hope many people in the disability community across the country will participate in the survey, which can also be found at:http://www.surveygizmo.com/s3/882523/TransitChoices. Please take the survey, and disseminate this notice so others take the survey. Your responses will help us understand what factors are most important to riders with disabilities when deciding which transit mode to use. The confidential results will be part of a national study called Transit Cooperative Research Project B-40: Strategy Guide to Enable and Promote the Use of Fixed-Route Transit by People with Disabilities. The goal is to develop strategies to improve bus and train systems for people with disabilities. DREDF's research partners are TranSystems Corporation, The Collaborative, and KFH Group. Please take the survey, and encourage others to do so! Research to develop the "Strategy Guide to Enable and Promote the Use of Fixed-Route Transit by People with Disabilities" is being conducted for the Transit Cooperative Research Program, which is part of the Transportation Research Board and the National Academy of Sciences. The research is supported by the U.S. Department of Transportation (USDOT). The prime contractor is TranSystems Inc., and the other members of the research team, along with DREDF, are The Collaborative and KFH Group. The disability community's participation is a key factor in our research. Through interviews (already conducted) and this survey, the project aims to gain a greater understanding of what factors most affect the choices people with disabilities make about which mode of transportation they will use for particular trips. This project will explore a variety of ways to encourage and enable people with disabilities who are at least part time ("conditionally") eligible for ADA paratransit to increase their use of the fixed route public transit bus and/or train service. Major areas of study will include improving the accessibility of bus and train systems, including the streets and sidewalks used to reach bus stops and train stations; providing optional travel training; providing fare incentive programs; marketing the benefits of bus and train services to the disability community; and exploring improved methods of paratransit eligibility determination. The study will also focus on the benefits of combining multiple approaches. For example, efforts to improve the pedestrian infrastructure, including public rights-of-way (PROW), can be more effective when priority stops are identified using information from travel training and eligibility determination. The Strategy Guide will stress a holistic approach to encouraging fixed route use. If you have questions, you can contact DREDF. Where Is My Disabled Parking Pass Recognized Outside My Own Country? Bert Morris and Laurianne Krid have published a valuable guide on parking permits and reciprocity ruls for their use between countries. The project was supported by the FIA Foundation and the FIA European Bureau in Brussels. Along with my colleagues Laurianne Krid and Caroline Ofoegbu at the FIA European Bureau, we are now refining and improving the FIA Guide, and raising awareness that it is freely available on-line. I would be grateful if you would circulate details of the FIA Guide for the disabled traveller to your readership. It is not without awareness of the tremendous disaster that has struck Japan that I offer the following story on the "Complete Street." As post -disaster planning eventually occurs the measure of cultural achievement will be the implementation of Universal Design. Fortunately Japan has an experts at their disposal in this regard. Among them is Satoshi Kose of Hamamatsu. According to "Re:STREETS," a new project focused on "inclusive design for the public realm," streets occupy more than thirty percent of all public spaces in cities. Over the coming decades, billions will be spent at the local level on their design and development. To ensure this massive investment in streets enables equal access for all users, a new universal street design is needed to balance the needs of pedestrians, bicyclists, transit riders, and car riders of all ages and abilities. Re:STREETS is taking a stab at creating an easy-to-download and plug-in green "Complete Street" template (see earlier post). The end goal of the project is a "comprehensive manual demonstrating design tools for building streets that promote healthy living, social interaction and commerce, as well as the movement of people and goods, while regenerating the ecosystem." The group says guidelines will be developed during a working conference hosted at the UC Berkeley College of Environmental Design in July. At the conference, attendees will cover issues like green infrastructure; "smart technology;" play and recreation; signage, wayfinding, and interpretation; urban agriculture and food production; and commerce. Before the conference starts, conference participants will get a technical manual and working group assignment, and will be tasked with creating solutions for specific problems. The manual will come out of the working conference reports, and will be available both in book format and online. The idea is to have the manual function as a "toolkit for implementing the Complete Streets policies that are being adopted throughout the United States." Private and public-sector professionals are invited to attend. Re:STREETS says "interested professionals from a wide range of disciplines are encouraged to participate, including urban planning and design, landscape architecture, architecture, civil engineering, traffic engineering, disability advocacy, public health, pedestrian advocacy, bicycle advocacy, transit, housing, economics, ecological sustainability, parks and recreation, maintenance, social services, materials manufacturers, and fire, police and safety." Re:STREETS will be held at the UC Berkeley's College of Environmental Design, July 21-23, 2011. The conference costs $250 to attend. Re:STREETS is funded in part by The National Endowment for the Arts and is being developed by PLAE, Inc., in partnership with the urban planning and design firm MIG. Project supporters include The National Complete Streets Coalition, America Walks and UC Berkeley College of Environmental Design's Department of Landscape Architecture and Environmental Planning. Learn how to apply to attend the conference. For more information, also contact Kirsten Negus at kirstenn@migcom.com. The AIA Young Architects Forum (YAF) and the AIA Committee on Design (COD) invites architects, students, and allied design professionals to submit sketches to the international 2011 YAF/COD Ideas Competition. Visit the competition website. In this unique sketch competition, submitters are asked to explore the concept of Universal Design as well as their overlap with values of social and environmental sustainability. Winners will be announced and will have their work exhibited at the American Institute of Architects (AIA) 2011 National Convention and Design Exposition in New Orleans, Louisiana, May 12-14, 2011. Selected entries will be displayed on the AIA website.
? Visit the Submission Site to Submit Now! Over the past decade, the planning and operation of the Olympic and Paralympic Games has been fundamentally re-defined, guided by an emphasis on inclusion, as well as social and environmental sustainability. In 2009, the City of Tokyo, Japan was one of several cities selected as a finalist to become the Host City for the 2016 Olympic and Paralympic games. The International Olympic and Paralympic committees ultimately awarded the Games to Rio de Janeiro, Brazil - but Tokyo again is in the process of compiling a bid for the 2020 Games. Inspired by the recent trajectory of thought and action exhibited by the IOC and IPC, the American Institute of Architects invites designers to participate in a design competition intended to build upon the efforts of the past decade by proposing a vision for Tokyo's bid for the 2020 Games that is guided not only by socially- and environmentally-sustainable principles, but also by the concept of Universal Design. Universal Design has been defined as "the design of products and environments to be usable by all people, to the greatest extent possible, without the need for adaptation or specialized design." This definition was developed by the architect Ron Mace, FAIA, an architect and the founder of the Center for Universal Design at N.C. State University. In recent years, architects and designers in the US and abroad have come to recognize significant and growing overlaps between Universal Design principles and emerging values of social and environmental sustainability. This year's design problem, to create a master plan for the Olympic Village and a design for a representative mixed-use building that includes athlete housing, will provide entrants with the opportunity to explore these overlaps. Successful solutions will demonstrate a commitment to Universal Design, as well as social and environmental sustainability, throughout the Village during its Olympic, Paralympic, and Legacy modes by creating designs that will allow the Village to play a vital role in the ongoing development of the City of Tokyo - not only for the short-term as athletes' housing during the Games, but also for the long-term as a catalyst for infrastructural revitalization once the Games have closed. The following section outlines the submission requirements, registration fees, eligibility details, and judging criteria. For more information, please contact AIA Honors & Awards at kcawards@aia.org. In the United States, designated bike lanes and a growing bike culture have started to garner mainstream attention. And bicyclists now have a giant ally--Google. At the 10th Annual American Bike Summit in Washington, D.C. last week, Google announced their maps feature will include bike routes for 150 U.S. cities. The feature includes 15,000 miles of off-street bike trails gathered by the Rails-to-Trails Conservancy, a Washington, D.C.-based nonprofit that has collected trail info for its website since 2007. Google made the decision after receiving a petition with more than 50,000 signatures for bike routes to be added to its maps. Google Maps introduced driving directions in 2005, and in 2007 the site added transit routes. Pedestrian navigation followed a year later. Now, it's the bikers' turn. Adauto Belli pedalou 1,6 mil km em bicicleta dupla, com o parceiro guiando. Ciclistas fizeram trajeto da Estrada Real em 18 dias; aventura virou livro. O convite partiu de um desconhecido. Quando o empresário Weimar Pettengill, 37 anos, ligou para o deficiente visual Adauto Belli chamando-o para uma viagem de bicicleta de Brasília a Paraty, se surpreendeu com a resposta. "Partimos quando? Amanh?? Hoje n?o dá. Estou ocupado", disse Adauto, 38 anos, adestrador de c?es. Na bicicleta de dois lugares (modelo conhecido como 'tandem') a dupla seguiu para Minas Gerais e, de lá, rumo a Paraty, no Rio de Janeiro. Completaram o trajeto em 18 dias, a maior parte feita em estrada de terra. Adauto, deficiente visual desde o nascimento, tem apenas 35% da vis?o. "A confian?a ali é tudo. Eu pedalo tendo certeza de que, se for bater, ele (Weimar, o ciclista que vai guiando) vai bater no macio, se cair, ele vai tentar fazer com que eu me machuque menos", conta. "Quando a gente está em uma descida no cascalho a 110 km/h, tem que ter muita confian?a. Se fosse com uma pessoa que vê perfeitamente, a viagem n?o teria dado certo", afirma Weimar. Entre as experiências registradas no trajeto, Adauto lembra das vezes em que sua pouca vis?o o enganaram. "Você acaba vendo o que quer ver. A gente ia descendo perto de um vale e eu dizia 'Nossa, é um lago muito bonito', e o Weimar come?ava a rir e dizia 'que nada, isso aí é uma favela! '", conta. Foram pouco mais de 1,6 mil km cruzados em 18 dias, de 29 de janeiro a 16 de fevereiro. A aventura rendeu até livro. Na última quinta-feira (21), Weimar Pettengill lan?ou em Brasília o resultado de suas memórias da viagem, entitulado 'Brasília-Paraty - Somando pernas para dividir impress?es' (editora Thesaurus). "Quero agora fazer o áudio-book, pra que o Adauto possa 'ler' e dizer se está tudo certo", brinca o autor. A obra também será lan?ada em Belo Horizonte, Rio de Janeiro e S?o Paulo. Antes de partirem em cima da bicicleta, os dois eram praticamente desconhecidos. Haviam se encontrado cinco vezes, apenas duas delas com a bicicleta para fazer testes. Weimar já planejava pedalar o trajeto da Estrada Real -rota histórica de povoamento e explora? ?o do interior do Brasil, criada no século XVII-, e decidiu incluir uma companhia no desafio. "Lembrei da bicicleta tandem e resolvi ir com um DV (deficiente visual) para compartilhar a experiência", conta o empresário. Ele chegou a Adauto através de amigos do projeto 'DV na trilha', que promove a inclus?o social de cegos através de bicicletas duplas em Brasília. Adauto sempre gostou de praticar esportes, e n?o pensa na deficiência como um obstáculo. Pelo contrário. "Muitas vezes é até uma vantagem, porque eu tenho que ficar mais concentrado", diz. Ele pratica o ciclismo desde 2007, mas seu esporte mesmo é a corrida. "Depois que eu o arrastei pra esse desafio, ele já arrumou o próximo, agora correndo. Vamos fazer a travessia dos Andes no final do ano", afirma Weimar. The Highway Safety Research Center has funding available for up to ten communities or neighborhoods to pilot test the use of "A Resident's Guide for Creating Safe and Walkable Communities", a newly developed guidebook that details ways to improve pedestrian safety and the walkability of local neighborhoods. Each selected pilot site will be provided $2,000 as well as technical assistance from pedestrian safety experts. Only government agencies and other not-for-profit organizations and neighborhood groups (e.g., PTAs, homeowner's associations, advocacy groups, etc.) are eligible to apply. Project funds will not be awarded to individuals. The complete Request for Proposals is available at the program's Web site. provide service to people with disabilities. From January to the end of September, [Regina] Paratransit completed 134,341 trips, averaging roughly 15,000 trips per month. However, during that same time period, 13,021 trips were refused due to a lack of capacity, an average of 1,447 per month. That is a considerable jump from a total of 5,279 unaccommodated trips during the same time period in 2007. "We've always had more of a demand than we can accommodate. We just have an aging population, for example, that requires the service as well. We haven't had as many accessible taxicabs available so I think that things like that can also contribute as well," Griffin said. The service runs at absolute capacity. While staff do all they can to carry as many passengers as possible, Griffin admitted the service is "maxed out."